President Wayne Bent (R) presents Harry Beckett with Lion of the Year award. Harry received this award for exceptional work and his willingness to help in a wide variety of club activities. The Westport Lions are like students, teachers, and the Ottawa Senators: excited to see what the new year will bring. Lion Don Baker announced that he is stepping down from being property chairperson. President Wayne Bent thanked Don and said that he had exceeded expectations performing this role. Until another person is found, Don will continue to perform his duties and make sure the current rentals are looked after. The membership showed their appreciation by giving Don a hardy round of applause. The members were in agreement that the job is too big for one person and should be divided up into several areas of responsibility. Jim Scala reported that the van account is in good shape, and it takes between $10,000 – $12,000 to cover the costs of operating the vans. So far this year, Westport area residents have taken 121 trips at a total distance of 17,155 km. Elgin area residents have used the vans 93 times at a total distance of 9,120 km. This adds up to a total distance of 26,275 km. over the course of 214 trips this year. Currently the club has 14 drivers, six of whom are Lion members, and eight are community volunteers. Lion Jim noted that community volunteers Bernie Maclean and Dennis Doyle drove a large portion of the trips. It was decided that the format for the fall meetings would be that the Officers would meet the first Tuesday of each month. The first general meeting of each month will be a business meeting and the second meeting of each month will be either a visitation, an invitation to other clubs to join us, or a guest speaker. Bob Reddick reported on this year’s very successful beach volleyball tournament. He thanked Dave Blair, Don Baker, Brad Baker, Bill Garland, Chris Hartley and Rick Warriner for their help in running the tournament. 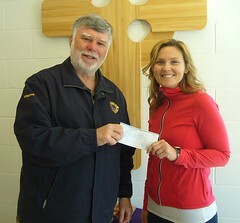 The members thanked Lion Dorothy Maynard for her outstanding job in chairing the $10,000 draw. All the tickets for this major fundraiser were sold due to a large part by the efforts of Kevin Kardash, Marty Hawkins and Heather Huth. Treasurer Jim Scala reported that all accounts are in good financial shape. He has set up a special account to pay bills by e-transfers. It is hard to believe with all the beautiful weather we been having lately, but Craig Jackson is already thinking about this year’s Santa Claus parade. If you have a suggestion for this year’s theme email it to westportontariolions@gmail.com and it will be forwarded to Craig. Wayne Bent commended René Reynen, Jim McGlade and Jim Scala for their exceptional work and improvements they made on next year’s cash calendars. You can purchase the 2019 calendars at various stores in Westport and from any Westport Lion. The cost is $20 for one, or six for $100. The highlight of the meeting was when president Wayne Bent presented the Lion of the Year Award to Harry Beckett. 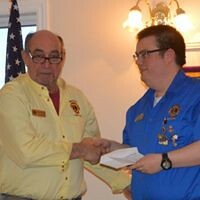 The president emphasized Harry’s exceptional work in all projects he is involved in, and his willingness to help out in a wide variety of club activities. 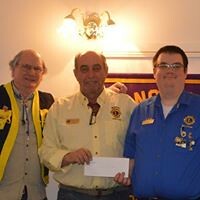 Kevin Kardash and Marty Hawkins each received the Distinguish Service Award for their devoted service to our club and Lionism. Lion Bill Garland was given a Lion pen for his outstanding work with the very successful Spring Draw. 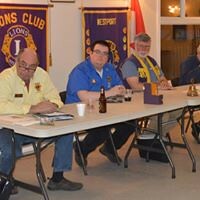 Our next general meeting is at the Lions’ hall at 6:30 p.m. on October 10th. Why not join us?